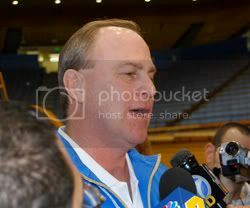 UCLA Head Coach Ben Howland provided an update on player injuries at his weekly press conference this afternoon. The team took three days off from practice after the Michigan game in Ann Arbor and held their first practice after returning on Wednesday. Junior point guard Darren Collison sprained his ankle yesterday towards the end of practice. He collided with Russell Westbrook and as both players got their feet tangled, Collison twisted his ankle by stepping on Westbrook's foot. He will be held out of practice today and is questionable for tomorrow's game against UC Davis. Collison's injury is not serious enough for him to wear a boot at this time. "He could probably do some shooting today," Howland said. "But I thought it was better to hold him out so he'll probably just get some treatment today." Howland remarked that Collison has continued to improve his play since his return from a knee injury and was satisfied with his play in the Michigan game, but confirmed he is not yet 100% back. "I think he played the best since he's come back but he's still not all the way back yet," Howland said. "It takes time to get back, its an arduous process. He hasn't even been back a month yet." Collison is scheduled to be able to play without his protective knee brace next week, the start of the Pac-10 season. As reported yesterday, Lorenzo Mata-Real injured his groin at practice on Wednesday. He is also questionable for tomorrow's contest against UC Davis. Howland is somewhat more concerned about Mata-Real's injury due to the possibility of lingering effects from a groin type of injury. "I've seen where groin injuries can linger for an entire season," Howland said. "His injury isn't major but we want to be careful." The flu bug has been going around the team. Howland stated that both Lorenzo Mata-Real and Michael Roll had the flu during their road trip to Michigan last week which affected their play. Mata-Real only played 8 minutes in the game. This week freshman center Kevin Love did not practice on Wednesday due to the flu and Howland, himself, is suffering from lingering effects of the flu as well. Howland is good friends with UC Davis Head Coach Gary Stewart which is part of the reason why the game with the Aggies was scheduled. "They run a Princeton offense and are super patient," Howland said. "Coach Stewart and his team beat Stanford two years ago, and we don't want to be in that same boat this year."